actiPLANS is an online leave and absence management solution aimed at streamlining the entire process to make it as easy to use as possible for both managers and regular employees alike. Scheduling a leave with actiPLANS is just a matter of submitting a request and having it approved by your assigned manager. The software keeps track of everyone’s balances, and allows users to setup individual balance accrual rules if necessary, so there’s no need to update that information manually. Thanks to an intuitive calendar-like interface, managers have a complete overview of the entire company’s schedule. They can see who’s currently in the office, who’s on leave, and who has any upcoming leaves or pending requests, which makes distributing workload that much easier. Plus, with constant access to that information there’s virtually zero chance of any clashes or conflicts between different employees’ schedules. It is crucial for both businesses to efficiently manage the leaves and absences of their workforce. 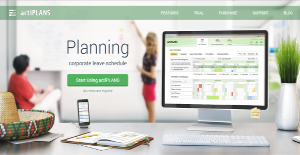 actiPLANS ensures that they plan their corporate leave schedule in a way that benefits both the employer and the employee by providing them both with a system that simplifies the whole leave management process. actiPLANS offers companies a centralized system that manages and automates basic process such as leave requests, approvals, and notifications. For employees, all they have to do is file a leave request via their desktop, laptop, or mobile devices. In a simple click, users can submit their request and wait for the manager’s approval. For managers, actiPLANS makes it simple for them to decide whether they should approve or reject an employee’s request for a leave. In a single view, they can see their whole roster of workers and know in an instant who are currently working and on leave, as well as those who have pending requests for leave. Once a decision is made, employees instantly receive a notification about it. Aside from leaves, actiPLANS is also a perfect tool in handling sick days and paid time off. The system can be tailored and make it adaptable to the company’s leave policy, thanks to the flexible accrual rules that comes with the system. Also, the platform makes it easy for employees to inform their supervisors and colleagues if they are running late or checking out early via actiPLANS app for iPhone and Android devices. This mobility and flexibility app effectively takes out the need for employees to make phone calls or send emails. What Problems Will actiPLANS Solve? 1. The traditional way of requesting leave time involves a lot of work: writing e-mails to your manager and HR staff, filling out printed forms, having your superiors approve them, etc… It’s bad enough as it is, but imagine if you need to submit your request on a very short notice. Impossible! Unless you use a tool like actiPLANS, where the whole process is just a matter of you selecting a date, a leave type and then clicking on a button to submit your request. The manager will then receive an email notification and will be able to approve or reject your request instantly, sparing you the frustration while saving your company money in the process. 2. Using Excel spreadsheets to keep track of its employees’ schedules, PTO balances and leaves is all well and good, until you need several managers to have access to the document at the same time. Sure, they could all take turns. Or better yet, instead of wasting their worktime that way they could use a system like actiPLANS, and have all the necessary leave time data in one convenient location, easily accessible from anywhere at any time. 3. Trust among coworkers is essential in companies of all sizes, but when it comes to manual data entry (like filling out a spreadsheet with your staff members’ schedules for the month) human error is inevitable. An automated tool like actiPLANS allows you to avoid this issue with the ability to view a detailed leave time history of any individual employee. That way, if any do mistakes occur, it’s very easy to figure out what exactly went wrong and correct them. If you are interested in actiPLANS it could also be beneficial to check out other subcategories of Best Employee Scheduling Software listed in our database of B2B software reviews. Each enterprise has different wants and requires a system that can be personalized for their size, type of workers and clients, and the particular industry they are in. For these reasons, no platform can proffer perfect functionality out-of-the-box. When you try to find a software app, first be sure what you want it for. Read some actiPLANS reviews and ask yourself do you want basic tools or do you want complex tools? Are there any industry-specific functionalities that you are seeking? Get the answers to these queries to aid your search. There are multiple aspects that you need to reflect on and these include your budget, particular business wants, your company size, integration requirements etc. Take your time, try out a few free trials, and finally zero in on the system that presents all that you require to improve your firm effectiveness and productivity. How Much Does actiPLANS Cost? We realize that when you make a decision to buy Employee Scheduling Software it’s important not only to see how experts evaluate it in their reviews, but also to find out if the real people and companies that buy it are actually satisfied with the product. That’s why we’ve created our behavior-based Customer Satisfaction Algorithm™ that gathers customer reviews, comments and actiPLANS reviews across a wide range of social media sites. The data is then presented in an easy to digest form showing how many people had positive and negative experience with actiPLANS. With that information at hand you should be equipped to make an informed buying decision that you won’t regret. What are actiPLANS pricing details? What integrations are available for actiPLANS? If you need more information about actiPLANS or you simply have a question let us know what you need and we’ll forward your request directly to the vendor.